ABOVE: The Palazzo Odoni's candlelit courtyard. INSET BELOW: Candles around the wellhead, and the palazzo's entrance on the Fondamenta Minotto. You want to stay in an authentic Venetian palazzo within walking distance of airport buses, land taxis, cruise-ship shuttles, or the People Mover to the Marittima cruise basin and the Tronchetto parking garage. The family that owns the hotel has lived in the 15th Century palazzo for five generations. 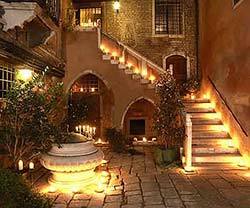 The lovingly-restored building has a flower-filled courtyard with a wellhead, a stone staircase leading to the upper floors, and rooms that are decorated in traditional Venetian style. Please note: The palazzo doesn't have an elevator. The staff will help you with your bags, but you'll need to haul yourself up the stairs. In the top photo, you can see the modern Calatrava Bridge that connects the Piazzale Roma (left) to the Santa Lucia Railroad Station (not visible). A bridge and sidewalk lead through the Papadópoli Gardens to the Fondamenta dei Tolentini. From there, a short walk takes you to the Fondamenta Minotto, where the Palazzo Odoni can be seen near the bottom right corner of the frame. In the second photo, the Palazzo Odoni is near the middle of the image, facing the canal to the right of the rectangular green awning.